M5 LED 70 Light set - 4" x 4" x 4" spacing (4" between each light with 4" leads) - One piece Construction for moisture protection - uses 80% to 90% less energy than standard mini lights. 24' Long - Commercial grade - Stay cool to the touch bulbs. Plug up to 40 Sets End to End - 3 Season warranty. Sold (12) strands per case. Our Mini Ice M5 bulbs has a diamond faceted bulb design that emits a beautiful light pattern, resulting in a warm white light ideal for any application. 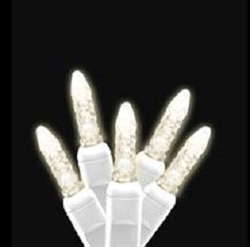 These are often purchased for wedding lights.